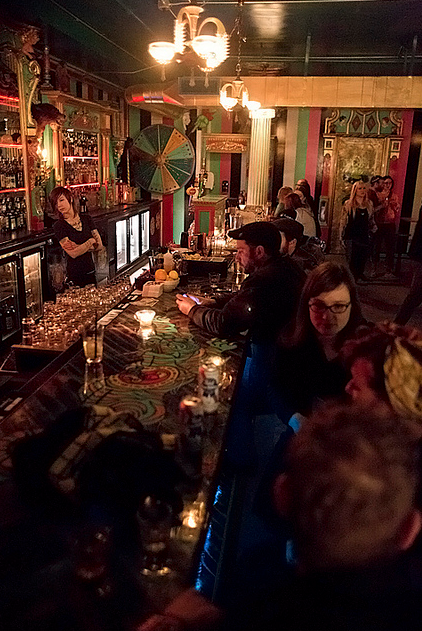 It’s a busy night for new Pike/Pine watering holes. Marcus Lalario’s transformed HG Lodge space debuts as 95 Slide. Pictures of the new Capitol Hill sports bar soon. Meanwhile, the Narwhal is finally ready to spring from the loins of the Unicorn up E Pike. We told you a little about the new subterranean space here and the genesis of the project here in spring 2011. We also told you about a delay or two in opening the new space — seemingly a tradition for Pike/Pine’s new subterranean layer. Here’s the Unicorn’s announcement of the opening. We’ll swing by for a picture or three, too. UPDATE: Pictures below! Narwhal is opening tonight! That’s right. You heard us correctly. Open at 9pm!!!! TONIGHT!!!! Pinball, Arcade games, wheel-of-drink, amazing things painted in weird places, sit in our ferris wheel seat!, you name it! It’s all here, down below, in the NARWHAL! … but without the decade of accumulated filth.